"Rupa Gosvami has stated that the five kinds of devotional activities -- namely, residing in Mathura, worshiping the Deity of the Lord, reciting Srimad-Bhagavatam, serving a devotee, and chanting the Hare Krsna mantra -- are so potent that a small attachment for any of these five items can arouse devotional ecstacy even in a neophyte. 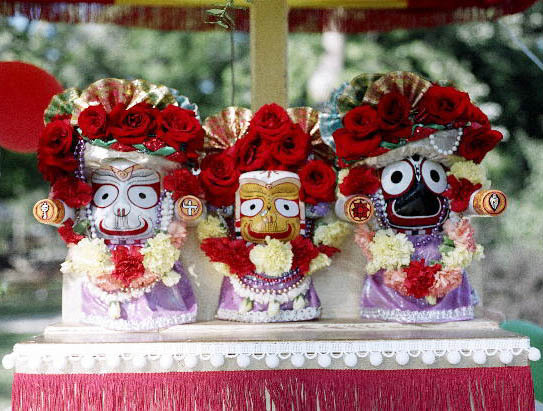 "Regarding worship of the form of the Lord, or Deity, Rupa Gosvami has written the following verse: 'My dear friends, if you still have any desire to enjoy the company of your friends within this material world, then don't look upon the form of Krsna, who is standing on the bank of Kesi-ghat [a bathing place in Vrindavana]. He is known as Govinda, and His eyes are very enchanting. He is playing upon His flute, and on His head there is a peacock feather. And His whole body is illuminated by the moonlight in the sky. "The purport of this verse is that if someone becomes attached to Sri Murti, or Deity of Krsna, by worshiping at home, then he will forget his relationship of so-called friendship, love and society. Thus it is the duty of every householder to install Deities of the Lord at home and to begin the process of worshiping along with all of his family members. This will save everyone from such unwanted activities as going to clubs, cinemas, dancing parties, smoking, drinking, etc. All such nonsense will be forgotten if one stresses the worship of the Deities at home."